My faith is in our Lord. I will not leave Him nor His church. No matter what the “experts” may say, as the knowledge of the “experts” changes daily, but Wisdom is eternal. “Blessed are they who are persecuted for the sake of righteousness, for theirs is the kingdom of heaven. Blessed are you when they insult you and persecute you and utter every kind of evil against you [falsely] because of me. I do not promote the link to this article, but stand with our Lord and pray for all who can identify with what is being said in it. If your faith is shaken, then you may be being called to place your complete and total faith and trust in our LORD and not anything nor anyone else! in every circumstance of my life. Father, you came down to me, you have come to me, you have touched my heart, you have spoken to me and promised joy, presence and salvation. By the grace of the Holy Spirit, who overshadows me, I, together with Mary, have been able to say to you yes, the ‘Here I am’ of my life for you. Now there remains only the force of your promise, of your truth: “You are to conceive and bear Jesus”. Lord, here is the womb of my life, of my being, of all that I am and have, open before you. I place all things in you, in your heart. Enter, come, come down again, I beg you, and make me fruitful, make me one who gives birth to Christ in this world. May the overflowing love I receive from you find its fullness and truth in touching the brothers and sisters that you place beside me. May our meeting, Father, be open, a gift to all. May Jesus be the Saviour. Amen. Just as our Lord was created for this, Mama, as were you. I thank our Lord for the gift of you, Immaculate Conception, to strengthen us, not only in that dreaded time of darkness, but in all time. On His Cross, as He spoke the words, “Woman, behold thy son. Son, behold thy mother.”, you “O most beautiful flower of Mt. Carmel, fruitful vine, splendor of Heaven”, became our Mother. 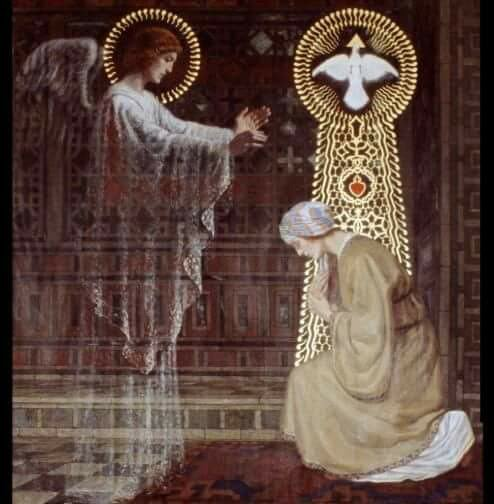 From the Annunciation and the moment of your yes, it was your yes that carry’s all your children through the dark and into the Light of your Son, as your Son, our Lord, carries us through to our Father. Thank you Mama, our Mother, O Most Beautiful Woman who the Holy Spirit had already descended upon to strengthen the Children of God in our days of darkness. Happy Mother’s Day. I love you. If you refuse to believe her, believe our Lord. Repent. Glory to God, always. A Marian prayer vigil was held on Saturday evening in St. Peter’s Square, with a special catechesis by Pope Francis. The statue of Our Lady of Fatima from the Portuguese shrine was flown to Rome for the event. The Pope was scheduled to consecrate the world to Our Lady during a Mass on Sunday. His prepared catechesis is re-produced below. We are all gathered for this event of the Year of Faith devoted to Mary, Mother of Christ and of the Church, our Mother. The statue of Our Lady, which has come from Fatima, helps us to feel her presence in our midst. Mary always brings us to Jesus. She is a woman of faith, a true believer. What was Mary’s faith like? 1. 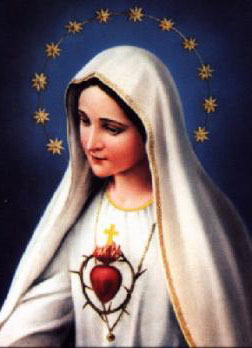 The first aspect of her faith is this: Mary’s faith unties the knot of sin (cf. Lumen Gentium, 56). What does that mean? The Fathers of the Second Vatican Council took up a phrase of Saint Irenaeus, who states that “the knot of Eve’s disobedience was untied by the obedience of Mary; what the virgin Eve bound by her unbelief, the Virgin Mary loosened by her faith” (Adversus Haereses, III, 22, 4). The “knot” of disobedience, the “knot” of unbelief. When children disobey their parents, we can say that a little “knot” is created. This happens if the child acts with an awareness of what he or she is doing, especially if there is a lie involved. At that moment, they break trust with their parents. How often does this happen! Then the relationship with their parents needs to be purified of this fault; the child has to ask forgiveness so that harmony and trust can be restored. Something of the same sort happens in our relationship with God. When we do not listen to him, when we do not follow his will, we do concrete things that demonstrate our lack of trust in him – for that is what sin is – and a kind of knot is created deep within us. These knots take away our peace and serenity. They are dangerous, since many knots can form a tangle which gets more and more painful and difficult to undo. But nothing is impossible for God’s mercy! Even the most tangled knots are loosened by his grace. And Mary, whose “yes” opened the door for God to undo the knot of the ancient disobedience, is the Mother who patiently and lovingly brings us to God, so that he can untangle the knots of our soul by his fatherly mercy. We might ask ourselves: What knots do I have in my life? Do I ask Mary to help me trust in God’s mercy, in order to change? 2. A second aspect is that Mary’s faith gave human flesh to Jesus. As the Council says: “Through her faith and obedience, she gave birth on earth to the very Son of the Father, without knowing man but by the overshadowing of the Holy Spirit” (Lumen Gentium, 63). This was a point on which the Fathers of the Church greatly insisted: Mary first conceived Jesus in faith and then in the flesh, when she said “yes” to the message God gave her through the angel. What does this mean? It means that God did not want to become man by ignoring our freedom; he wanted to pass through Mary’s free assent, her “yes”. But what took place most singularly in the Virgin Mary also takes place within us, spiritually, when we receive the word of God with a good and sincere heart and put it into practice. It is as if God takes flesh within us; he comes to dwell in us, for he dwells in all who love him and keep his word. Let us ask ourselves: Do we think about this? Or do we think that Jesus’ incarnation is simply a past event which has nothing to do with us personally? Believing in Jesus means giving him our flesh with the humility and courage of Mary, so that he can continue to dwell in our midst. It means giving him our hands, to caress the little ones and the poor; our feet, to go forth and meet our brothers and sisters; our arms, to hold up the weak and to work in the Lord’s vineyard, our minds, to think and act in the light of the Gospel; and especially our hearts, to love and to make choices in accordance with God’s will. All this happens thanks to the working of the Holy Spirit. Let us be led by him! 3. The third aspect is Mary’s faith as a journey. The Council says that Mary “advanced in her pilgrimage of faith” (Lumen Gentium, 58). In this way she precedes us on this pilgrimage, she accompanies and sustains us. How was Mary’s faith a journey? In the sense that her entire life was to follow her Son: he is the way, he is the path! To press forward in faith, to advance in the spiritual pilgrimage which is faith, is nothing other than to follow Jesus; to listen to him and be guided by his words; to see how he acts and to follow in his footsteps; to have his same sentiments of humility, mercy, closeness to others, but also his firm rejection of hypocrisy, duplicity and idolatry. The way of Jesus is the way of a love which is faithful to the end, even unto sacrificing one’s life; it is the way of the cross. The journey of faith thus passes through the cross. Mary understood this from the beginning, when Herod sought to kill the newborn Jesus. But then this experience of the cross became deeper when Jesus was rejected and Mary’s faith encountered misunderstanding and contempt, and when Jesus’ “hour” came, the hour of his passion, when Mary’s faith was a little flame burning in the night. Through the night of Holy Saturday, Mary kept watch. Her flame, small but bright, remained burning until the dawn of the resurrection. And when she received word that the tomb was empty, her heart was filled with the joy of faith: Christian faith in the death and resurrection of Jesus Christ. This was the culmination of Mary’s journey of faith, and that of the whole Church. What is our faith like? Like Mary, do we keep it burning even at times of difficulty and darkness? Do I have the joy of faith? This evening, O Mary, we thank you for our faith, and we renew our entrustment to you, Mother of our faith.